The Tiger Who Came to Tea prowls into the Piccadilly Theatre! 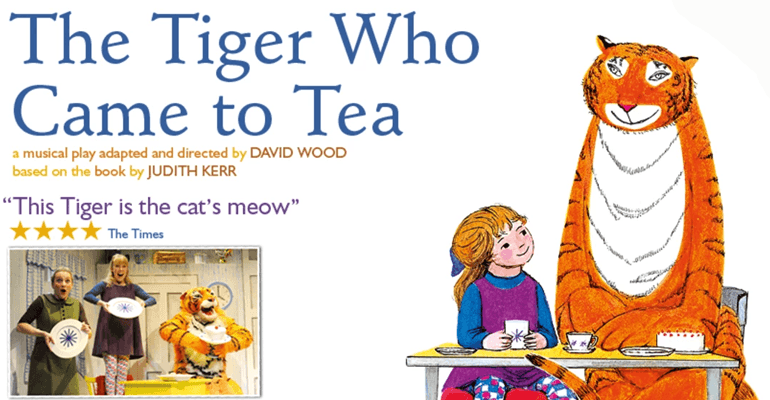 David Wood's magical stage adaptation of Judith Kerr’s beloved children’s classic The Tiger Who Came to Tea returns to the West End to play a very special season at London's Piccadilly Theatre. Celebrating 10 years of fun on stage and 50 years of entertaining young readers, the well-known tale of a hungry animal has been adapted for tiny theatregoers, to create a vibrant, family-friendly show. Returning to the West End after multiple successful runs at the Lyric Theatre, the hilarious and interactive production is choreographed by Emma Clayton and follows the story of Sophie and her Mum, who have a huge tiger come for dinner. When the doorbell rings at teatime, the last thing they expect to see is a giant stripy beast! Soon, the pair discover that their guest is far hungrier and thirstier than they ever could have imagined - and what will happen when Daddy comes home and finds out there is nothing for dinner? Packed full of songs, laughter, fun and plenty to engage audiences of all ages, The Tiger Who Came to Tea brings to life a much-loved childhood story and is perfect for those with vivid imaginations. The Tiger Who Came to Tea is recommended 3+. A show created specifically for children, they will enjoy the bright colours and fun songs.